Poor service is commonplace. You’ll find it everywhere you look, along with the dissatisfied and irate customers whose only mistake was to choose the wrong people or company to do business with. The field of transportation and trucking is no different. There are plenty of companies that will offer you the world as long as you sign up with them, but they always fall short of delivering what they promised. Late shipments, inferior customer service, frustrating tracking options… The list of most companies’ shortcomings goes on and on. 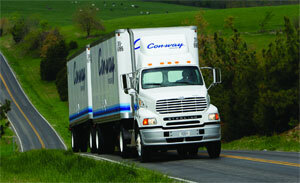 However, like a diamond in the rough, Conway Trucking is quite different from the rest. Here’s a quick glimpse of the company that you’ll surely want to handle all your shipments from this moment on. Customers worldwide owe their thanks to the founder of Con-way, Inc., Leland James, who established the company in Portland, Oregon in 1929. Back then, the small trucking company was called Consolidated Truck Lines, which flourished into a highly successful business through numerous acquisitions and countless expansions. Later on, the company was renamed and was known as Consolidated Freightways. A lot happened to the company over the years that passed. One major highlight occurred in the year 1983, when Con-way Transportation Services came into existence to provide the markets that weren’t fully accommodated by Consolidated Freightways with regional short-haul services. Apart from the innumerable service centers set up in various states across the United States, three regional companies were established: Con-way Eastern Express, Con-way Western Express, and Con-way Central Express. On their first day of business, the said carriers had a total of 230 employees and 334 trucks, trailers, and tractors to handle the 113 shipments that were entrusted to the company. The business has come a long way since then. Now, this $2.6 billion-revenue company, the headquarters of which can be found in a Michigan town, has 32,750 trailers and tractors, over 365 operating locations, and 16,600 employees to handle the voluminous business that countless clients offer. If you’re in the market for a less-than-truckload motor carrier that offers extensive freight services, then Con-way is a great choice. Whether you require transcontinental, inter-regional, or regional trucking services, Con-way can get the job done on time with outstanding results. The company not only covers North America and Canada, but also offers cross-border service in Mexico. With over 425 operating locations, the company can assure you of faultless and reliable coverage that you’ll be hard-pressed to find with any other establishment. So aside from all that have been mentioned previously, what makes Con-way such a great company? Well, most importantly, it lives by the company’s core values of excellence, collaboration, integrity, commitment, and safety. When all these values are present, everything just falls into place – superior results, excellent employees, and an overall outstanding organization. What’s even better is that Con-way is constantly looking for ways to improve in all aspects. So as the needs of its customer base change, Conway also strives to keep up and satisfy those needs. Granted, a lot of trucking companies are out there. However, few can compare to the quality and superiority of the services offered by Con-way. It’s not just the smartest choice; perhaps, it’s the only choice.